Headaches coming from you Neck. We can help! Are the Holidays Giving You A Headache Already? Christmas is coming… Headaches ruining your Holidays ? For many of us, the holidays come with a little bit of stress. Whether it’s caused by hosting parties, over-crowded malls, or the mere thought of hanging out with your in-laws, stress can creep up on us this time of year. Our neck and shoulders carry a lot of this stress, and our suboccipitals are tiny muscles that can cause all sorts of headaches and neck pain when we feel stressed out! The suboccipitals are a triangular group of muscles that sit at the base of the skull and attach onto our first and second vertebra. They are responsible for tilting our head into an extended position and also assist in rotation. Why Do They Cause Headaches? The most likely cause of trouble with the suboccipital muscles is poor posture. When we slouch and adopt a rounded shoulder position, our neck naturally would slouch forward as well. That means our head would be looking down if we didn’t compensate with other muscles. In order to keep looking straight ahead, our suboccipitals contract and help us keep looking straight ahead. Poor posture is a problem for many people. This means that many people are likely suffering from tight suboccipitals muscles! When these muscles get tight, it causes a lot of tension at the base of the skull and the top of the neck. They also can refer pain behind the ear, into the temple and even behind the eye. 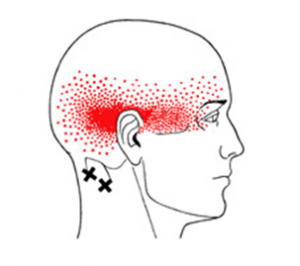 A headache in these areas can be a result of tight suboccipital muscles! Chiropractors have a lot of tools in their toolbox to treat the suboccipitals. There are some specific muscle release techniques that will release these muscles. Gently compressing the muscles while rotating the head will stretch the muscles and help them relax. The suboccipitals connect your skull to your first two vertebra. When these muscles are tight and our head gets stuck in extension, it can irritate and stiffen up the joints at the top of the neck. There are specific adjustments for your top vertebra that can decrease the tension. There are acupuncture points that go right into the suboccipitals at the back of the head. If you’re experiencing headaches, and these muscles are tight, acupuncture can work like magic! Wondering how acupuncture works? Check out our acupuncture information page! There are a lot of postural exercises that would help these muscles. They become overactive when our posture is poor, so correcting our posture works wonders at letting these muscles relax. Specifically, strengthening the muscles in the front of the neck make sure that the muscles in the back of the neck don’t fall into a shortened/tight position. There are a series of exercise progressions for the deep neck flexors that can influence the position and tension in the suboccipitals. Using a tennis or lacrosse ball and pushing it into the muscles at the base of the skull can help ease tension in the suboccipitals. Try this technique laying down, or against the wall! Both of them are effective! There are many ways that chiropractic can help with neck tension. Get a head start on treating your holiday stress and book an appointment with Dr. Steve or Dr. Jenn today!